Bahoukas Antique Mall has a beautiful 1912-1914 Edison Gramophone with a selection of wax cylinders. It’s a beautiful piece. Edison had a wonderful view of the many uses that would benefit society that included dictation, recorded books for the blind, music boxes, and others. Another view of the beautiful Edison Gramophone available at Bahoukas. Many of the uses Edison suggested for the phonograph have become a reality, but there were others he hadn’t imagined. 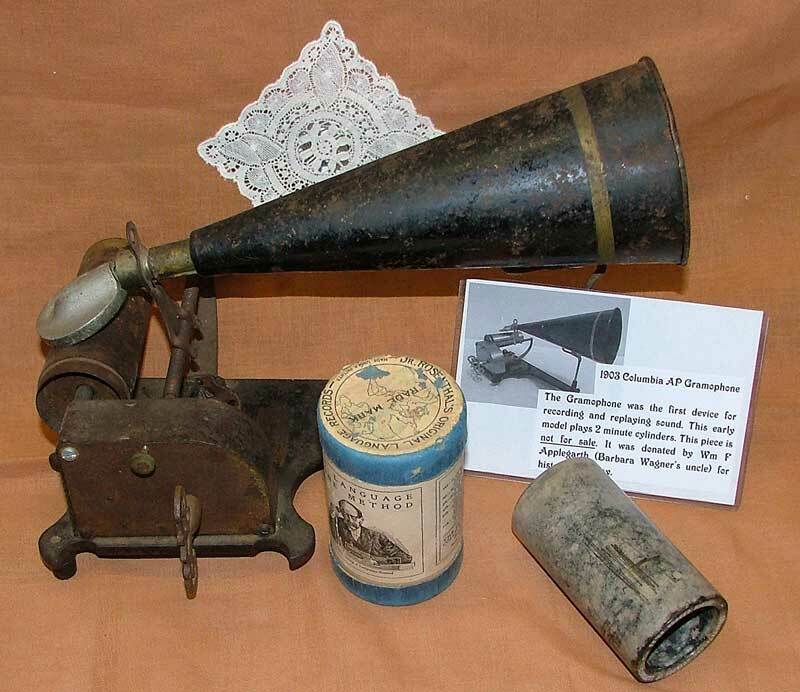 For example, the phonograph allowed soldiers to take music off to war with them. In 1917, when the U.S. became involved in World War I, the Edison Company created a special model of the phonograph for the U.S. Army. This basic machine sold for $60. Many Army units purchased these phonographs because it meant a lot to the soldiers to have music to cheer them and remind them of home. This is an audio clip of Edison himself in which he expresses his pride in the soldiers and reminds Americans of the enormous sacrifice and contribution made by the other allied nations. 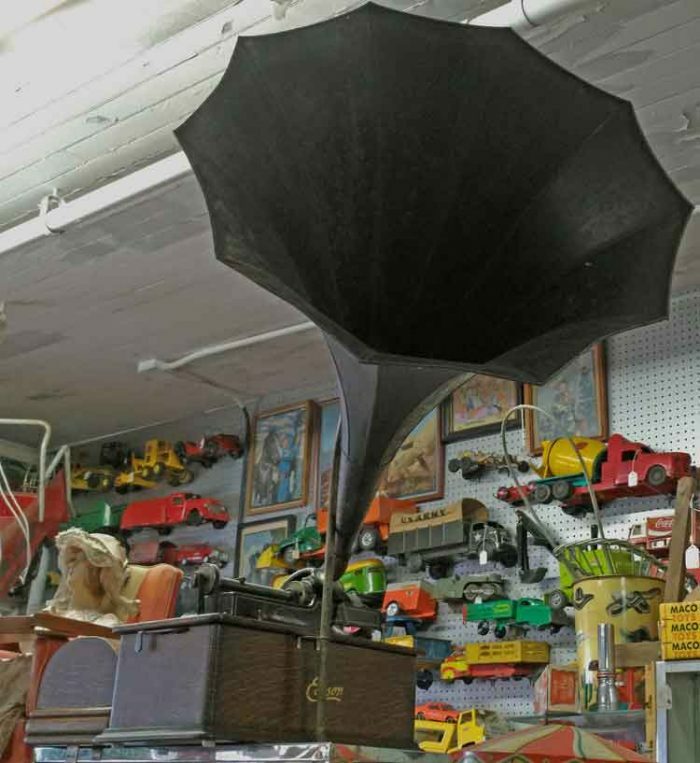 Stop in soon and see this beautiful Edison Gramophone. We have others as well as newer model phonographs/record players. 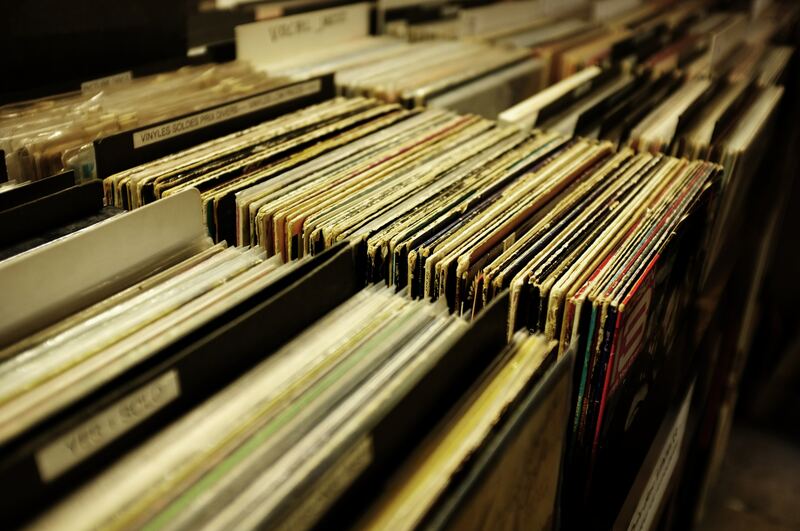 You do know the records are coming back – right? Well, we’ll be watchin’ for you! They’re not in a Surprise Box, but it is an interesting shelf. Among the items are old typewriter ribbons and a Pitch Master Tuner. Below is a quote from an article that talks about the movie from 2012 titled “Pitch Perfect.” Yes, there are 3 movies altogether. Pitch pipes are pitchy. Like, I don’t even know why we use pitch pipes anymore. They sound like dying cats. But we keep using them because they are classic, and at the end of the day everything about a cappella has its roots in the old school, bougie, landed gentry with matching blazers, etc. Do you remember being in the chorus and having someone use the tuner to get everyone on pitch and ready to sing? Below is a unique use of the Pitch Pipe as a sound healing tool to tone the instrument of your body, mind, and spirit. As you see, we learn a lot of things working at Bahoukas Antique Mall. We love sharing it, too. So yep, we’ll be watchin’ for ya. Come on in and pay us a visit. This unique drum was brought to our shop recently. It’s a marching snare drum from the 1940s that was used by Maurice Pippin in the Drum & Bugle Corp of Bristol, VA before WWII! It’s in good condition with 2 sets of sticks and a cloth cover. Stop in and have a look. It’s quite beautiful. 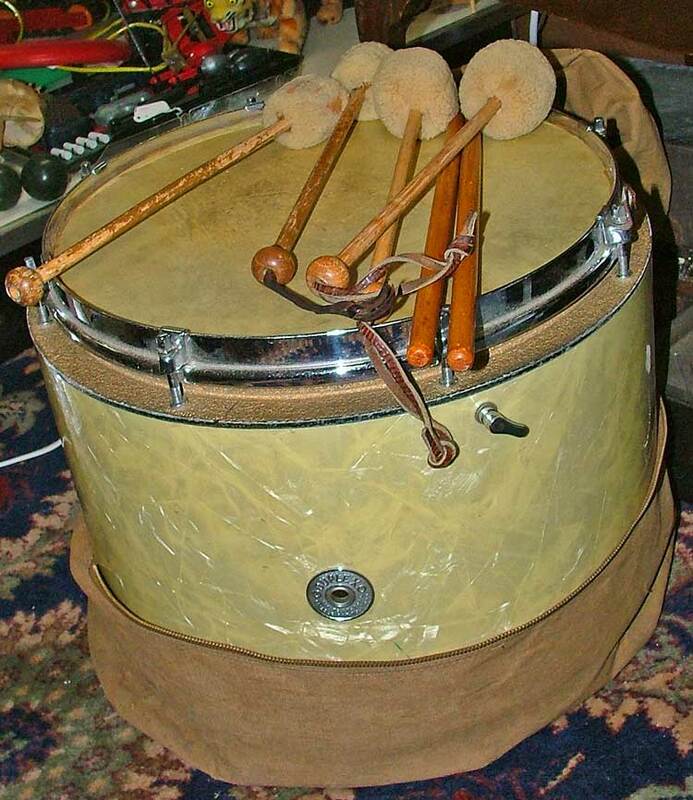 Imagine the history this drum could share if it could talk. Maybe a drummer can bring out its story. Oh, and by the way, we’ll be watchin’ for ya! … mean food, shopping, meeting up with friends, games, vendors, and MUSIC!! And we have the memorabilia to add to the fun! 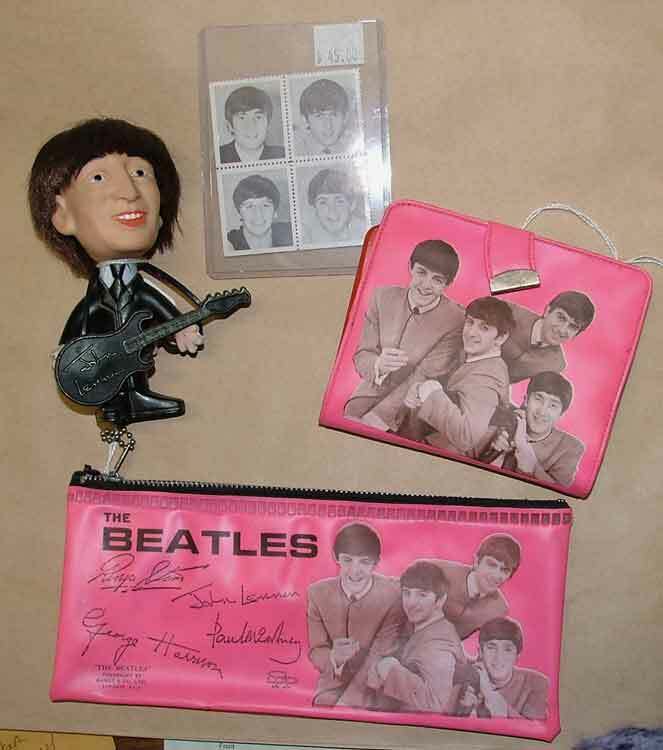 Above are a number of fun Beatles items: a John Lennon figure, Beatles stamps, and a pink wallet and pencil case – all from the ’60s! 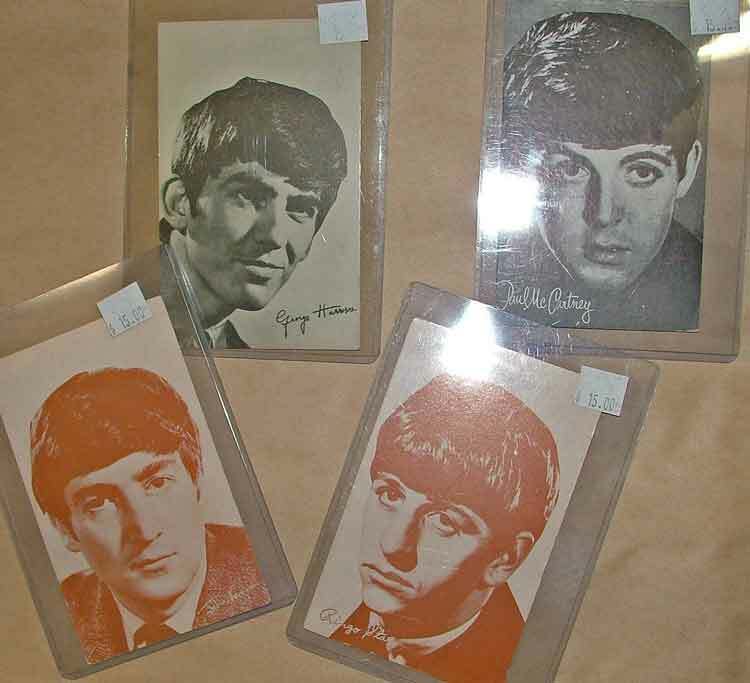 Below are Beatles trading cards. Beatlemania was the intense fan frenzy directed towards the English rock band the Beatles in the 1960s. The phenomenon began in 1963 and continued past the group’s break-up in 1970, despite the band ceasing public performances in 1966. So much of the music from the 1960s and 1970s is still loved today by all ages. So as you enjoy our First Friday, don’t forget to stop by Bahoukas and check out our Beatles, Elvis and more music memorabilia PLUS CDs, Records, and more. Yep, we’ll be watchin’ for ya! These 5″ resin busts would make a wonderful collection for that lover of classical music or maybe even someone who IS a classical musician! Left to right: R. Wagner, Bach, Handel, F. Schubert and Beethoven – these unique pieces are quite detailed! Have someone on your friends/family list that would truly love these? If so, stop in and browse at Bahoukas in Havre de Grace. You can be sure, we’ll be watchin’ for ya! How many ways can you play stringed instruments? If you go to another blog post on our site, CLICK HERE, you can also enjoy the beautiful sound of the dulcimer and the mandolin. Music seems to be as old as the human race. It has comforted us, given us joy, led us to war, and created amazing celebrations. These wonderful instruments are in our front window. Stop by and see them for yourself. We’ll be watchin’ for ya! Gift giving never has to be a challenge… instead think of it as a creative endeavor. Would a special person on your list appreciate a gift that shares some interesting history about the birth year, or the year you met, or another significant time in their lives? 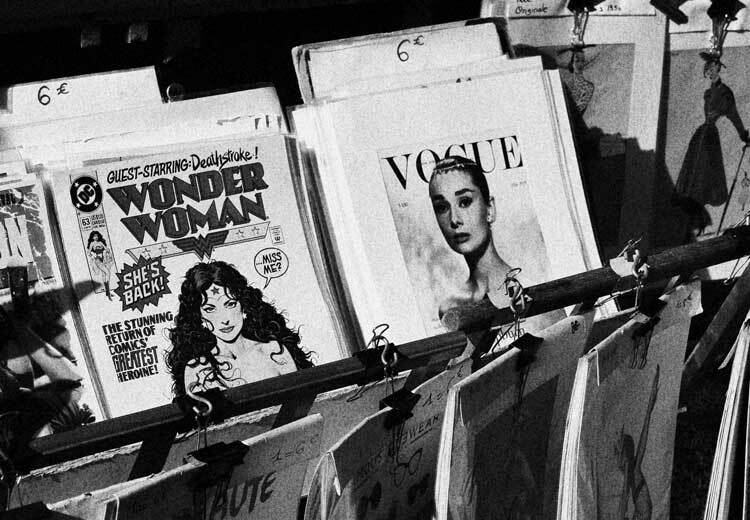 For instance an old magazine from their birthdate or birth year will most certainly create conversation as folks share stories that they remember. Here, at Bahoukas Antique Mall, we have a number of old magazines that just might ‘fill the bill’ for that year you’re looking for. Or maybe it’s a childhood book that you find among our shelves that would be a real hit for a gift! Another unique item can be music from a given year. This, too, can bring a flurry of conversation… and quite often, dancing! And yes, we have record players if you need one! … or a toy from a particular era, or maybe a toy related to a tv show of years gone by are a few more ways a collectible can make a perfect gift. We highly recommend that if you give a collectible item to a younger person, encourage them to find the tv show, commercial, or other piece of info about the item by searching on the internet. That bridges the generations and also brings a collectible to life! …license plates, sports items including collectible cards, models and hot wheel cars, Angels of the Year figures, Barbie Dolls, and even World’s Fair memorabilia. So come on, put you’re thinking cap on and start remembering those ‘good ole days’ … because you just might find a gift that will not just be a box to unwrap, but will become the ‘life of the party’ as you all share memories – we consider this the perfect gift. Visit our blog posts for 44 Days of Gift Giving if you need more ideas to tickle your imagination. The countdown is on…. Christmas is definitely close… so stop in and let us help you find the perfect gift at Bahoukas Antique Mall and Beer MuZeum. We’ll be watchin’ for ya! Elvis Presley was rock & roll’s first real star, not to mention one of the most important cultural forces in history, a hip-shaking symbol of liberation for the staid America of the 1950s. A white Southerner singing blues laced with country, and country laced with gospel, he brought together American music from both sides of the color line and performed it with a natural sexuality that made him a teen idol and role model for generations of cool rebels. He was repeatedly dismissed as vulgar, incompetent, and a bad influence, but the force of his music and his image was no mere merchandising feat. 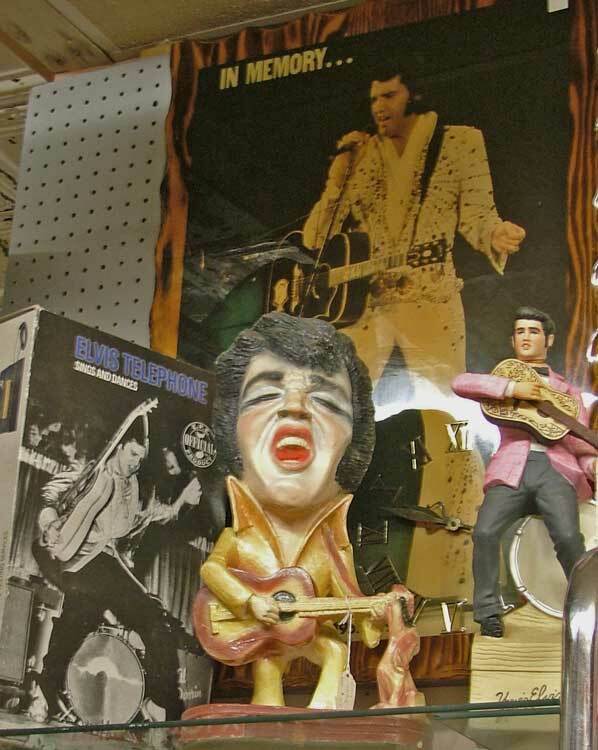 Presley signaled to mainstream culture that it was time to let go. Four decades after his death, Presley’s image and influence remain undiminished. While certainly other artists preceded him to the alter of rock & roll, he is indisputably The King. 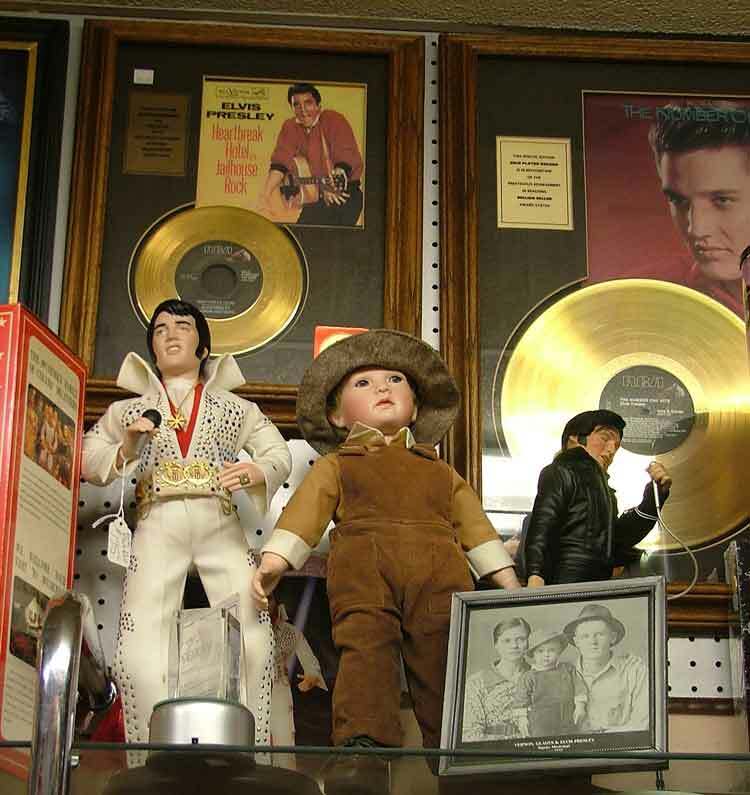 We have an entire section dedicated to ELVIS – THE KING including music wind-ups, Gold Records, Whiskey Decanters, telephone, collector plates & tins, AM Radio, dolls, figurines, stamps, puzzles, and shot glasses. 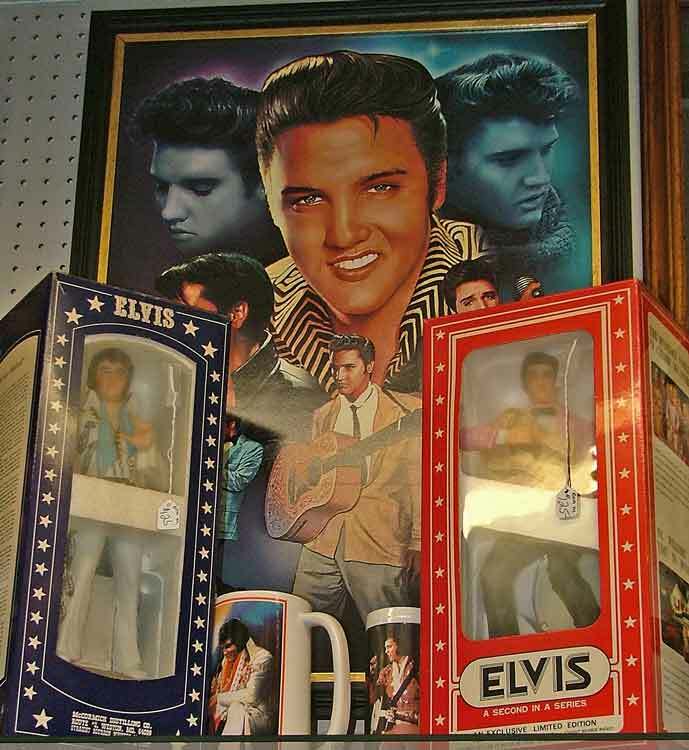 If you loved ELVIS, or know someone who does, we can definitely help you find the perfect gift for your or their collection! Check out this awesome youtube video …. just in case you forgot how amazing ELVIS was! 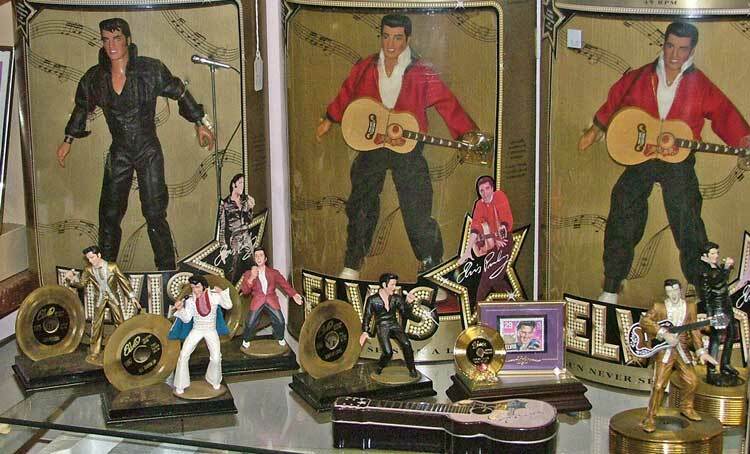 Here are a few more photos of a small portion of our ELVIS COLLECTIBLES available at Bahoukas Antique Mall and Beer MuZeum. 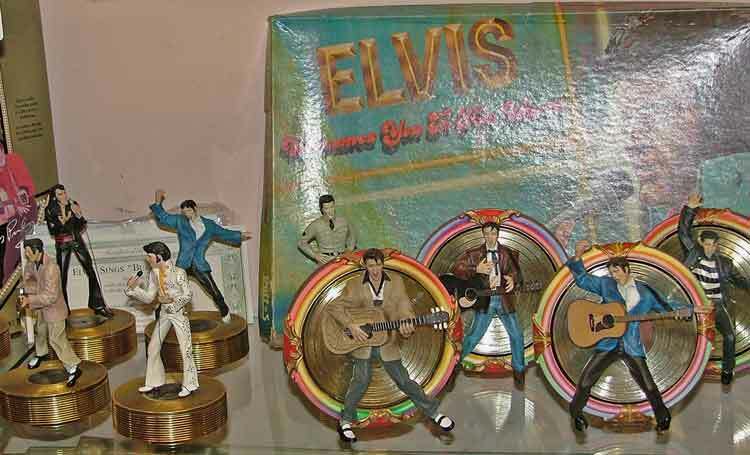 Stop by soon and pick up the perfect ELVIS collectible for you pleasure or to give as a gift this holiday. Don’t forget – we’ll be watchin’ for ya! A Sampling of Different Ways to Listen to Music! In this photo we have a sampling of the many ways we’ve listened to music over 100+ years that include: vinyl records of 45 rpm, 33 rpm, and 78 rpm. The bottom right displays a cassette tape and an 8-track tape. We bet you learned how to use a pencil to rewind a tape that has gotten twisted and pulled out of its case! We also have many record players for sale. CLICK HERE for a post on record players and maybe you’d like to learn about a Caliphone. 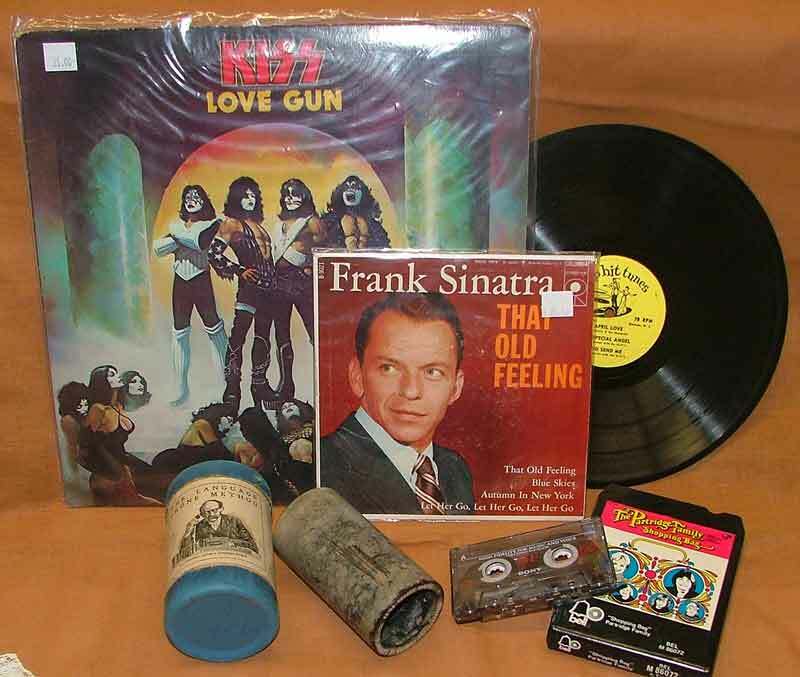 The bottom left of the above photo is a wax cylinder record – very fragile (not for sale). In the photo above is a 1903 Columbia AP Gramophone. 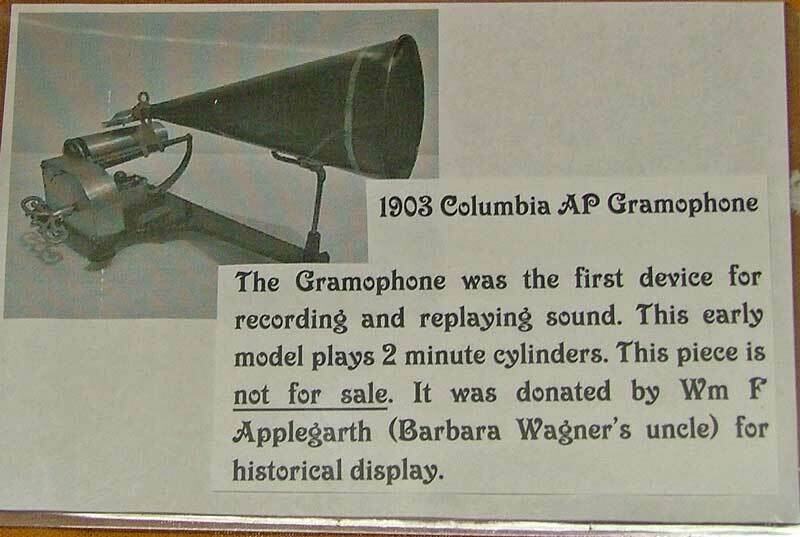 CLICK HERE for a wonderful history of the Gramophone! 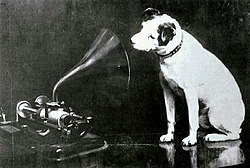 Do you remember the name of the dog used in the RCA Victor logo? NO? CLICK HERE for more information! Blue Amberol Records was the trademark name for cylinder records manufactured by Thomas A. Edison, Inc. in the US from 1912 to 1929. They replaced the 4-minute black wax Amberol cylinders introduced in 1908, which in turn replaced the 2-minute wax cylinders that had been the standard format since the late 1880s. Blue Amberols can play for as long as 4 minutes and 45 seconds and have a surface layer of the “indestructible” plastic celluloid, which Edison tinted a trademark blue color. Edison brand phonographs designed to play Amberol cylinders were named “Amberolas”. At Bahoukas, we have some surprising finds to make it easy for you to find the perfect gift. And you have 36 days left to complete your gift-giving shopping! Hurry in … and remember, we’ll be watchin’ for ya! Musical Instruments – oh yes! You’ve seen our posts for violins, dulcimers, and other musical instruments. Now enjoy an electric chord organ, trumpet and trombone! Are you ready to start your own band? We can help with that! 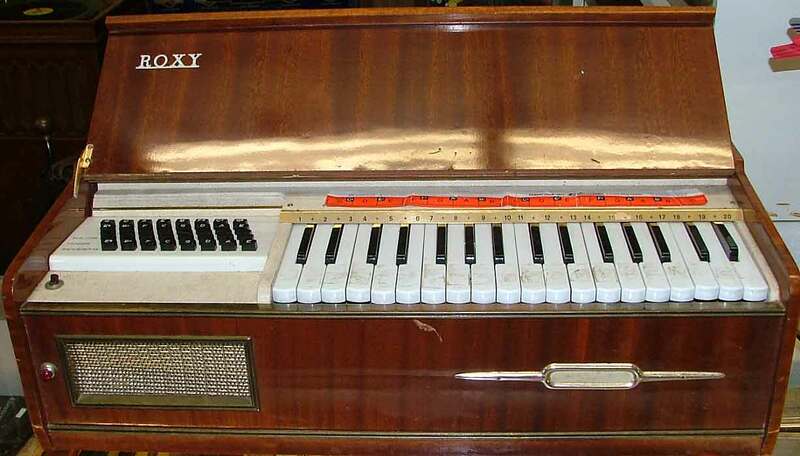 In researching this Roxy Organ, it appears to be from the 1960s. It’s electric and is a table top model. It may have had legs for it at one time. It still plays and is quite an interesting piece! Stop in and let us hear you play! Below you can see the organ with the cover closed. Handsome piece of furniture. 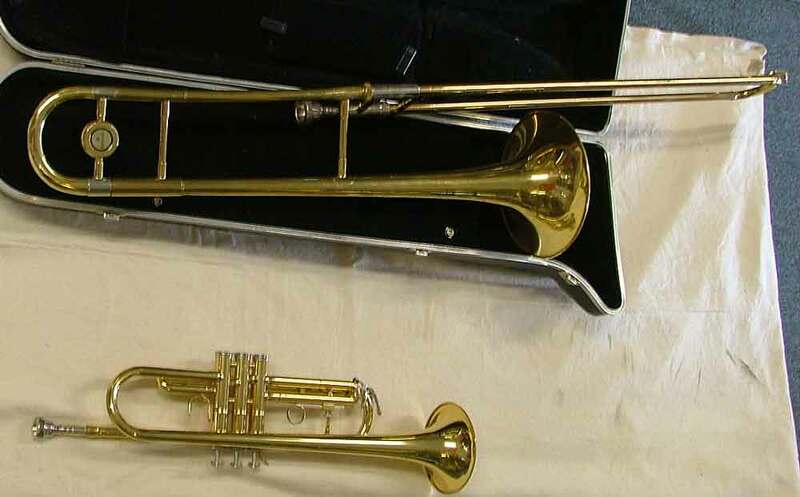 Below is a Besson trombone with case and a Holton (Leblanc) trumpet. Did we say we could help you start your own band. We most certainly can. These instruments all work and are waiting for someone who is ready to appreciate them to come in and adopt them. We’re always telling you what great and unusual finds you might discover when browsing at Bahoukas Antique Mall and Beer MuZeum. These are just a few items that you might not think of looking for here. Stop by today. Let us know what you’ve been searching for because we just might surprise you with what we have! We’ll be watching for you! Musical Instruments are a great holiday gift. 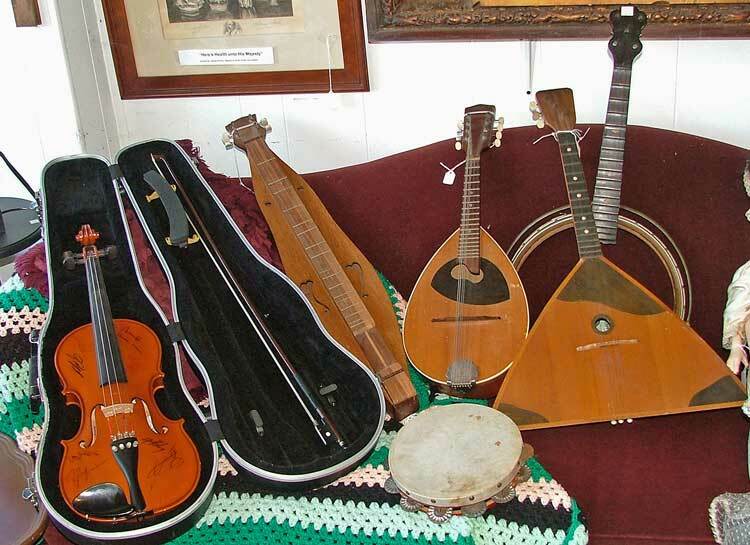 We have 3 unique stringed instruments sure to entertain the musically inclined on your Christmas List! We’ve even included some videos to help you imagine the instruments finding ‘life’ in your home! Though they are unique, if you search YouTube, youll find a number of popular songs being played on these older instruments. Delight the musician in your family with one of these fine pieces. Or, if you must, give them – at the very least – a beautiful place to live in your home. Stop in soon. Two weeks from today it’s all over but the unwrapping! The Folkcraft Instruments Dulcimer is handmade in the U.S. Listen to this artist play one and learn a bit more about it. The Balalaika is a 3-string Russian Guitar and has a wonderfully intriguing history going back to 1688. The link takes you to Wikipedia where you can read all about it. Below is a simple video for tuning. You can subscribe to this guy’s channel on YouTube to learn more (all free)! The Bauer Bowl Mandolin is 8-strings. It’s a really pleasant sound. Check out the video below. 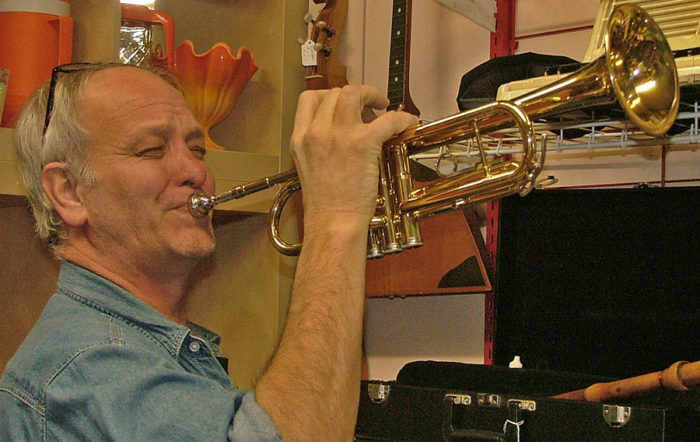 A Student would absolutely love this trumpet! This Holton Trumpet by LeBlanc actually works (though you may not want to ask George to play for you!). It comes with its own case and a student book. What a perfect gift for the aspiring student! We’ve learned that the Frank Holton Company has a long history and included several fine musicians using their instruments including Frank Holton himself – lead trombonist for the Sousa Band and Maynard Ferguson! You just never know what’s available at Bahoukas until you stop in and browse. Leave some time, there’s lots to see! Holiday Gifting #2 is perfect for the young musician on your list. This 4/4 violin comes with bow and case. It’s a copy of the famous Stradivarius 1713 and has a label that says ‘adjusted in 2004’. It’s beautiful, covered with autographs, and might be the perfect first instrument for a musician on your list. 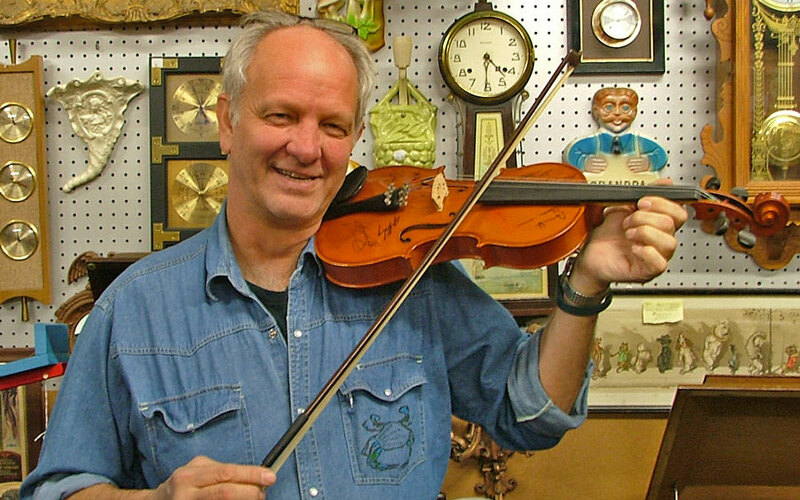 It’s in excellent shape … well, as best as George knows (about violins). Don’t waste a minute. Stop in to look at this beautiful instrument.